It’s only fitting that there are two ways to look at Us. In one sense, writer/director Jordan Peele’s latest original hit is a straight-up terrifying horror film centering around the family (led by Lupita Nyong’o and Winston Duke) fighting a foursome of doppelgangers during an ill-fated beach vacation. But Peele also has a lot to say in terms of who we are as human beings and Americans. Now that you’re breathing again and back to a resting heart rate, let’s delve into the latter. Much like Peele’s Oscar-winning Get Out, multiple viewings are required to catch all the wink-winks and to get a firm handle on the message. Here are 10 answers to your burning questions. And only light spoilers ahead — Peele would slay me with scissors if I revealed all the twists! It’s for real. Hands Across America was a benefit event for the homeless staged in May 1986 in which approximately 6.5 million people held hands in a human chain for 15 minutes along a path across the contiguous United States. (Do yourself a favor and check out the cheeseball music video on YouTube, which features Glenn Close and Barbra Streisand.) “It this idea of American optimism and hope, and Ronald Reagan-style-we-can-get-things-done-if-we-just-hold-hands,” Peele recently explained. “It’s a great gesture—but you can’t actually cure hunger and all that.” But the charity coincided with more scarring images: “That was when I was afraid of horror movies. That’s when the Challenger disaster happened. There are several 80s images that conjure up a feeling of both bliss and innocence, and the darkest of the dark.” To wit, in the real HAA commercial that airs in Us’ opening moments, the people are illustrated in red and the announcer brags that the Americans will all be “tethered together.” That’s what English teachers refer to as a foreshadow. The scissors-equipped doppelgangers dressed in red jumpsuits that dwell underneath the ground aren’t necessarily evil. Duke told audiences at SXSW, “Theyfinally had an opportunity to see the light and see the sky and see for the first time. ‘You have all the things I want. You get to express all the things I desire. They’re comingfrom place of need while the Wilsons are coming from place of comfort.” Peele’s take? “It’s personal for every individual. The movie is this country. When I decided to write it, I was stricken with the fact that we are in a time when we fear the other, whether it’s the mysterious invader that wants to kill us, take a job, votes the other way. We point the finger. But the monster maybe has our face. 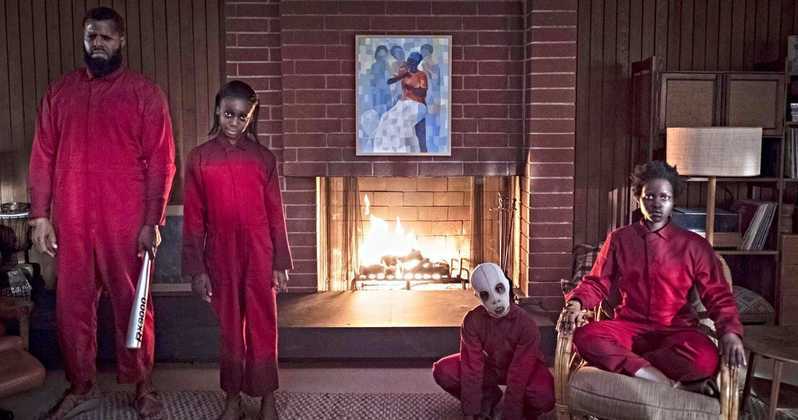 The evil is us.” Again, Peele tips off the audience early on: At the family breakfast table, young Jason tells his father that when you’re pointing the finger at someone you’re really pointing three fingers back at yourself. Because they’re notthe same. Peele asked his makeup crew to make the doppelgangers look different than their counterparts because they’ve experienced different — and more torturous — lives in the shadows. More specifically, he wanted them to resemble “subtle vampires.” (This is per the Us production notes. Thanks Universal!) Makeup head Scott Wheeler also modified the look of each Wilson family doppelgänger in ways that helped reflect his or her character because there tended little less personal care involved in the look of the doppelgängers. Patriarch Gabe, for instance, has a nicely groomed beard. His doppelgänger just has this biblical beard that he’s let grow out. Not quite. Here is Peele’s official explanation: “The idea of being able to utilize a flash of red going by in the darkness to signify your monster was exciting, and it carries with it this connotation of an escaped prisoner or patient.” There’s a cultural reason as well: As Us’ story launches in 1986, the color is a nod to classic 80s frights such as Michael Jackson’s “Thriller” jacket, Michael Myers’ jumpsuit from Halloween and Freddy Krueger’s switchblade glove. Duh. It harkens back to the duality theme: Scissors can be used in ways that are both mundane and useful (i.e., making an arts and crafts project) and terrifying (i.e., a stabbing weapon). Nyong’o does both in Us. Even the shape of scissors has a duality. Look at the finger openings and how they resemble two heads. Notice how they spread apart. Now you’ll never look at them the same way again. “I can not confirm or deny a connection to Get Out,” Peele recently told a prying interviewer. Still, there are hints aplenty. In one scene, Nyong’o sits silently and fearfully as tears stream down her face — just as Daniel Kaluuya did during his hypnosis in Get Out. Just as Get Out saw white people hypnotise African Americans to hijack and take over their bodies and minds, Us‘ violent doppelgangers could easily be an extension of the ‘sunken place. One more fascinating fan theory: In the car, Nyong’o’s character tries to teach her son how to stay in rhythm to the hip-hop song “Got Five on It” but she’s noticeably off-beat herself. That’s just the sort of peculiar behavior you’d see at one of Allison Williams’ family’s Get Out garden parties. But those Home Alonejokes in Us were killer! But wait . . . the Emmy-winning star of the Comedy Central sketch series Key & Peele still considers himself a comedy guy. He’s just pushing different buttons. “My DNA as an artist is a desire to provoke,” he says. “If I’m not doing something that might piss people off, I’m probably doing it wrong. I think the biggest mistake I can make is creating something that lands as being as a bully somehow as opposed to lifting the underdog. You can step over the line in comedy.” And FWIW, his next work? Voicing a character, alongside his former partner Keegan-Michael Kay, in June’s Toy Story 4. That’s a Disney movie. The tethered people eat them. They wander around the underground. Peele has said that the furry animals are intended to subvert expectations. Beyond that, you got me. Maybe it’s a subtle nod to Fatal Attraction? « ‘Us’ Delivers ‘Extreme’ Thrills and Chills: Read the Early Review!